All IVAA members agree to abide by this Code of Ethics as a condition of membership. Members shall always exercise integrity, honesty and diligence in carrying out their professional duties and responsibilities. Members shall safeguard the interests of their colleagues and clients, and shall not knowingly be a party to any illegal or unethical activity. Members shall enter into no agreement nor undertake any activity which may be in conflict or give the appearance of conflict with the legitimate interest of their client, or that would prejudice their capacity to perform their professional duties. Members shall protect any confidential information obtained in the performance of their duties, and shall not use such information for personal gain nor in a manner that would be detrimental to their client or any other party. Members shall continually ensure the currency of the knowledge, skills and technical competencies required to perform their professional activities. 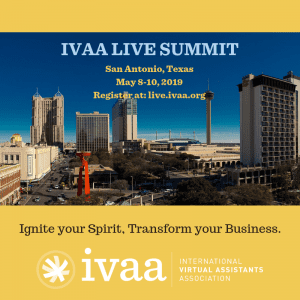 Members shall refrain from conduct or action which would detract from the reputation of the IVAA or the profession of Virtual Assistance as a whole. Members shall be mindful at all times of their responsibilities as professionals toward the community at large.